Posterous, the blogging platform that Twitter bought in March 2012 for an undisclosed sum, appears to have stopped taking registrations for new users for Posterous Spaces. One tipster noted to TechCrunch that this has been the case for at least a week now, and it was also noted by a poster on Y Combinator’s Hacker News. Posterous was incubated and funded by YC in 2008. There don’t appear to be any issues with Post.ly, Posterous’ URL shortening service that posts links, text and photos to Twitter. We have reached out to Twitter to ask what is behind this and will update as we learn more. For now, there is still an option to sign up on the home page, although an attempt to do so brings up an error page. The inability to sign up could point to a couple of different things. The first is that the blogging site may be making a move towards closing down, or changing its service. At the time of the acquisition, the two said Posterous would remain “up and running without disruption” and that any changes would be flagged with “ample notice.” In December, Posterous began to let users back up and export their data — a feature that Posterous and Twitter had initially said would be appearing in the “coming weeks” after the service got acquired. Some speculated that this could be a first sign that the service might finally close down this year. In that vein, closing Posterous to new sign-ups would make sense. The second possibility is a little more pedestrian: the site may simply be experiencing a technical glitch. 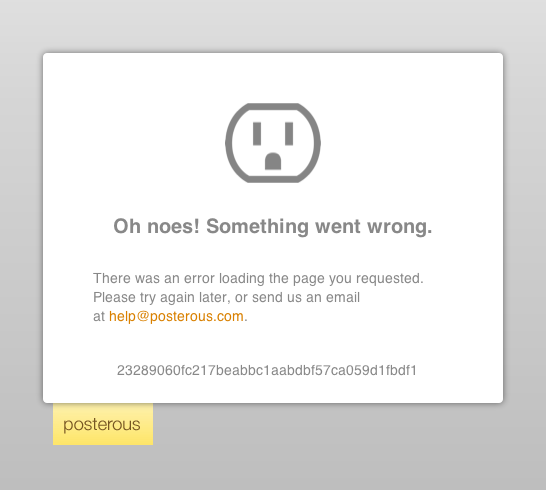 Posterous has had more than one of these over the last several months, including a service outage due to a lost database, a DDOS attack, and image uploading issues. Flagging these has been the main function of Posterous’ Twitter feed for the last several months. One sign that this may not be a technical glitch, though, is that Posterous is usually quick to respond to and fix problems — eg, this problem with photo uploads from about 16 hours ago — whereas the error for new-sign-ups has been ongoing for at least a week, and there have been no public responses made to people asking about it. Twitter in December noted that it had passed 200 million monthly active users, and 400 million tweets per day on Twitter itself. As it continues to hone that business with more revenue-generating services like ads, one primary focus will be to keep users engaged on its main platform. With Posterous’ founder and CEO Sachin Agarwal now product manager at Twitter, it’s hard to see where Posterous Spaces, as it looks today, fits longer term.